Our Top Pick is: Sona D.
There's something so appealing about Sona's card! Is it the well-chosen colours? Is it the stitching? Could it be the creative interpretation of our sketch or the well-placed embellishments? It must have something to do with that adorable image! Or maybe they just all combine to make a very eye-catching and award-worthy entry! It certainly hooked our Design Team! Talk about being faithful to the sketch, Sarah's entry nails it!! And her retro colours carry on the vintage theme of the challenge as well! 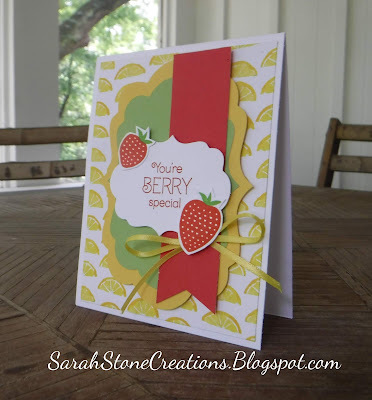 The Design Team loved the delicious freshness of Sarah's card with her berry images! Lovely! Congratulations to our winners and thanks to everyone who played along! I hope you'll come back and check out our new "fill in the blank" challenge tomorrow! Our winners can pick up their badges on this page and display them with pride on their blogs or sites.